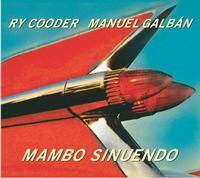 Mambo Sinuendo, Ry Cooder's 2003 collaboration with Cuban guitar legend Manuel Galbán, which won the Grammy for Best Pop Instrumental Album, has returned on vinyl for the first time in some 15 years. "Mambo Sinuendo creates a time-warped neverland where unhurried melodies hover above subtly swaying Cuban rhythms," says the New York Times, "as the two guitar masters trade slides and twangs with a droll sense of romance." The vinyl edition — pressed from lacquers cut by Abbey Road Studios on two 140-gram vinyl discs at Record Industry in the Netherlands with a custom etching on side D based on the original album art, and housed in an old-style, tip-on gatefold jacket — is out now and available for sale. The album hearkens back to a point in the late 1950s when Cuban popular music began to hint at a fusion of American pop-jazz and the futuristic creations of modern Cuban composers (like Perez Prado). Borne along by the mid-century mambo and cha-cha-cha crazes, the hot sounds of mambo-jazz spread out into American popular culture — Perez Prado was Vegas-bound; Stan Kenton hit the road with his "Cuban Fire" orchestra; Henry Mancini scored Touch of Evil à la Prado; and Duane Eddy had a Top 10 hit with the mambo-esque "Theme from Peter Gunn." But nowhere can there be found a more perfect representation of this style than in the recordings of the Havana doo-wop quartet Los Zafiros. As Los Zafiros's guitarist and arranger, Manuel Galbán pioneered a tough, rocking guitar style that is considered by Cuban musicians to be unique in their music. Mambo Sinuendo reintroduced Manuel Galbán-pianist, organist, and guitarist extraordinaire. I’ve always liked the CD,but this vinyl version is exceptional. Firstly the surfaces are very quiet and the vinyl is flat. The sound quality has great dynamics and detail, huge soundstage with 3D depth. Nice to be very pleasantly surprised by a reissue.